You wouldn’t think the Chevrolet Bolt could compete against the Volkswagen GTI, but they’re more similar than you maybe want to believe. The Fast Lane Car answered the question of which is faster off the line: all-electric or powered by plain old gasoline. The drag -ace results weren’t all that surprising. 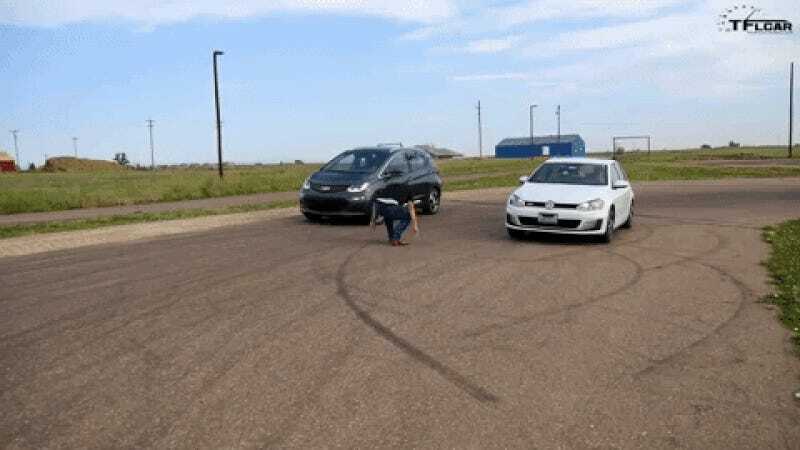 Even though the Bolt has a 467-pound disadvantage over the GTI, all that additional torque available down low means the GTI doesn’t have a chance in shorter drag races like this. I’m pretty certain in a longer drag race, the Bolt’s lead would all but disappear. Under the hood of the VW GTI is a 2.0-liter turbo with 210 horsepower and 258 lb-ft of torque, whereas the Chevrolet Bolt has an all-electric equivalent of 200 HP and 266 lb-ft. The obvious advantage from a standstill goes to the Bolt with all of that electric power available, but the GTI’s sport mode tries its best to wring as much power from that turbocharged engine’s power band as it can. And even though charge times of the Bolt don’t come close to the convenience of being able to pull up to any number of gas stations to refill, the increasing number of Bolt sales every month means at least some Americans are willing to make that tradeoff. We can see that in a straight line at least, the Bolt is a tad quicker than a traditional GTI at city traffic speeds. Now we need to see how both drive against each other on a twisty canyon road to really compare the handling of the two. What About Putting A Leaf In The Mix?